Knuckles Clan citizens in Sonic Adventure. 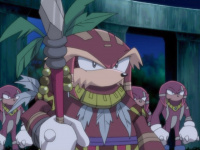 Chief Pachacamac, flanked by Knuckles Clan warriors in Sonic X. The Knuckles Clan was an ancient echidna civilization, of which Knuckles the Echidna is the final descendant. Thriving as a powerful tribe four thousand years before Sonic's time, the Knuckles Clan's downfall served as a major plot point in Sonic Adventure. The Knuckles Clan seems to have been a fairly peaceful society until close to the end of its existence; the Sonic Chronicles: TDB manual states that "...the planet's dominant Echidna race had been blessed with centuries of peace" (p4). They built the great stone pyramid cities in Mystic Ruins, close to the shrine of the mysterious Chao and their Master Emerald. At some point, Chieftain Pachacamac inherited the leadership of the tribe from his mother, and while initially a compassionate ruler, the death of his wife turned Pachacamac into a hard-hearted warmonger. The tribe expanded hawkishly, conquering neighbouring nations and fighting a protracted conflict against the Nocturnus Clan, another ancient echidna civilization led by Imperator Ix. His tribe embroiled in bloody warfare, Pachacamac set covetous eyes upon the Chaos Emeralds, which he believed were keys to the Knuckles Clan's survival and victory. Despite the pleas of his daughter Tikal, Pachacamac assaulted the emerald shrine - an act which more than any other defined the course of history in Sonic's world. The shrine's guardian, Chaos, was so enraged by Pachacamac's indiscriminate slaughter of the Chao that he transformed into Perfect Chaos with the power of the emeralds, and lay total waste to the Knuckles Clan. Their civilization was wiped out almost overnight, and the energy backlash from the Master Emerald threw Angel Island into the air. With the Knuckles Clan obliterated, the Nocturnus were able to colonise almost all of the ancient world, before they were expunged from history by their own cataclysm: the Argus Event. The few survivors of the Knuckles Clan that remained after Perfect Chaos' attack went into terminal decline over the ensuing centuries. Knuckles is the very last member of the once-great civilization. This page was last edited on 12 July 2010, at 11:48.